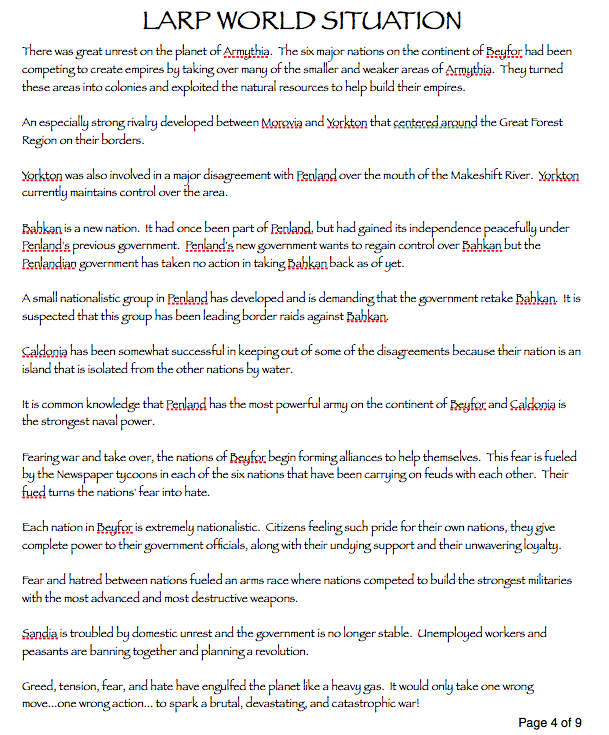 Activity 1: Know Thy Nation! First of all, we need to get set up for our LARP. 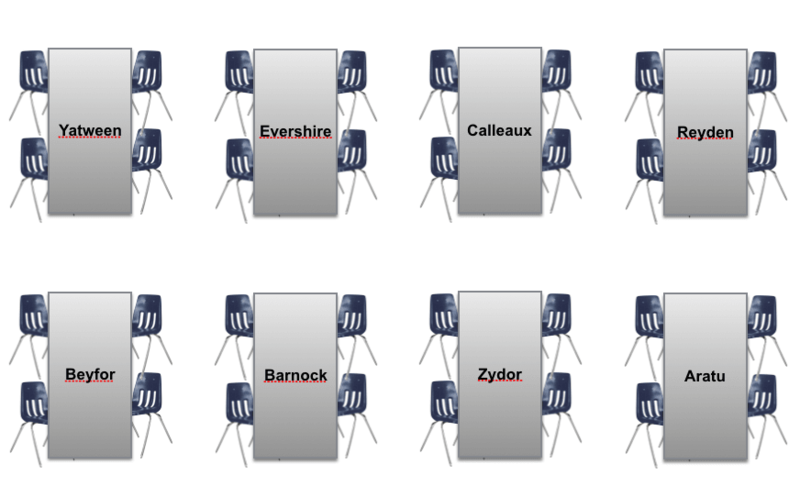 Each table will represent an empire on a fictional planet called Armythia. There are 8 empires on Armythia. The chart below shows which tables represent which empires. You will have 5 minutes to complete Step 2. The next thing we need to do is set up your Lesson Chronicles. You will now receive a Table of Contents. Write your name on the Table of Contents and put it behind your syllabus in your Lesson Chronicles. Everyday, you will do work that goes in this folder. When you receive this work, you will put it in the prongs of your folder. You will write the work in your Table of Contents and record your grade in the grade column. Every night, you will take this home and share what you have learned with your family. 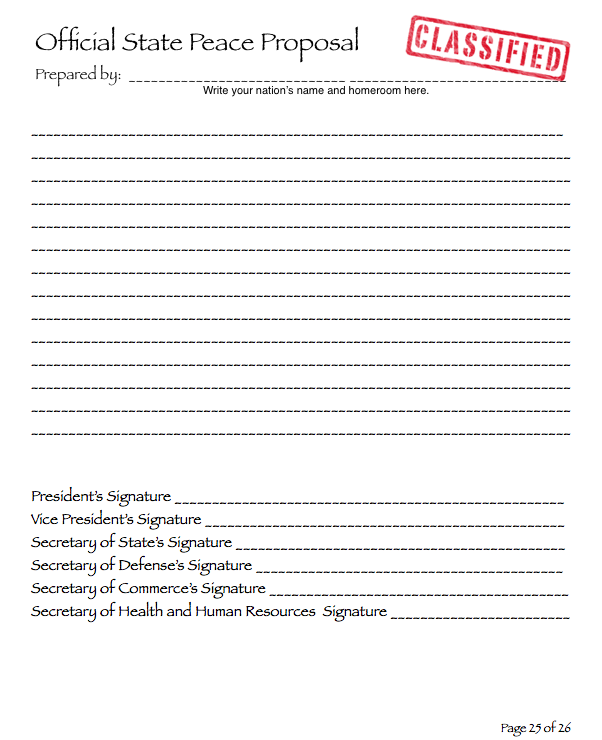 A parent will need to sign by each entry in the Table of Contents after you share it with them. Every Friday, I will do a folder check to see if they have signed. If these are not signed, you will serve silent lunch or P.E. detention until they are signed. We will have 5 minutes to complete Step 3. Now, we need to gather our materials and resources for our LARP. Each group will now receive a black crate. The black crate has your nation's name on the front. In the crate you will see folders. You need to listen carefully about how to use these folders. First of all, one person will get the crate from underneath the blue top counter everyday. You will also have one person return the crate there at the end of every class. In the crate your will see folders. First, pull out the black folders. These folders are your groups World War Live Action Role Play Information Books. There is one for each group member to USE IN CLASS! DO NOT TAKE THESE OUT OF THE CLASS FOR ANY REASON! Do not show this folder to any other groups. It is a secret for your group only! Do not share any of the information in this book with any other groups in in any other classes either. You will now pull out one colored folder. Your color will depend on the homeroom you are in. Look at the list below. 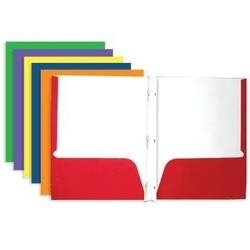 Pull out your homeroom's colored folder. This is your Surveillance Information Packet. You will share this folder as a group. Your homerooms and folder colors are listed below. Remember, DO NOT TAKE THESE OUT OF THE CLASS FOR ANY REASON! Do not show this folder to any other groups. It is a secret for your group only! Do not share any of the information in this book with any other groups in in any other classes either. ​You will have 5 minutes to complete Step 4. ​For Step 4, you need to hold elections for the government positions in your nation. The following is a description of each job. 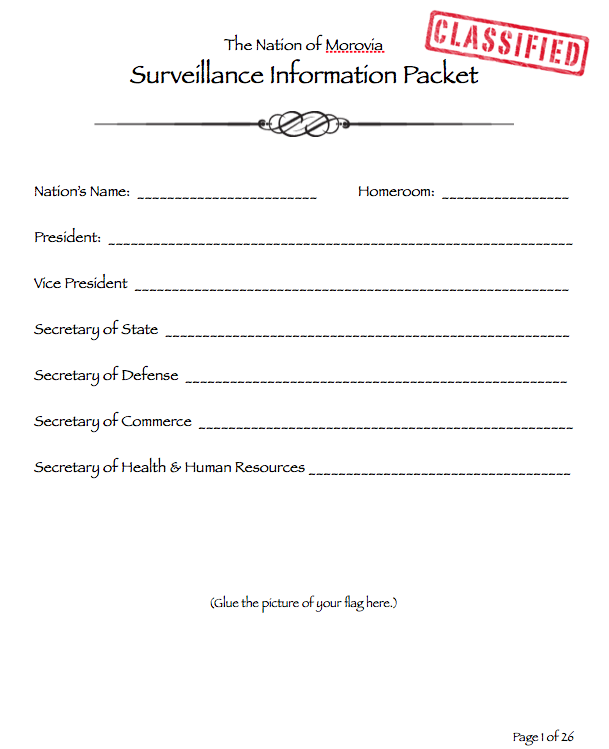 The vice president for the group will then fill in Page 1 of the colored folder - the Surveillance Information Folder that outlines the people in your group that hold each job. I have embedded page 1 below. President: This person is the group leader. They organize and lead group meetings. They make national announcements about decisions of the government. Vice President: This person assists the president and other cabinet members and does the job of any group member who may be absent. They take the place of the president if the president is unable to complete his or her duties. They also do all the writing for the group. Secretary of State: This person negotiates agreements and alliances with other nations. They advise the president regarding decisions on foreign policy. They make national announcements about situations and issues with other nations. Secretary of the Defense: This person advises the president about the military and other nations' militaries. They advise the president regarding decisions on defense and war. 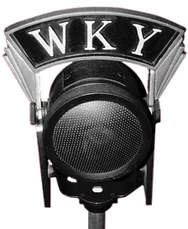 They make national announcements about situations and issues regarding the military and national security. Secretary of Commerce: This person advises the president about the economy and other nations' economies. They advise the president regarding decisions regarding money. They make national announcements about situations and issues regarding the nation's finances. Secretary of Health and Human Resources: This person advises the president about the people (the citizens). They advise the president on the wants and needs of the nation. They make national announcements about situations and issues regarding the people's concerns and how the government is addressing those concerns. They will do the writing for the group if the vice president is absent. Groups with five members will have one group member performing two roles. One group member will be required to perform the jobs of the Secretary of Commerce and the Secretary of Health and Human Resources. You will have 5 minutes to complete Step 5. Turn to Page 2 of the colored folder - the Surveillance Information Folder. On this page you will see the map that is embedded below. In this LARP, you are a pretend nation, in a pretend continent, on a pretend world. You live on the planet of Armythia. Your six nations are the major powers on the continent of Beyfor. 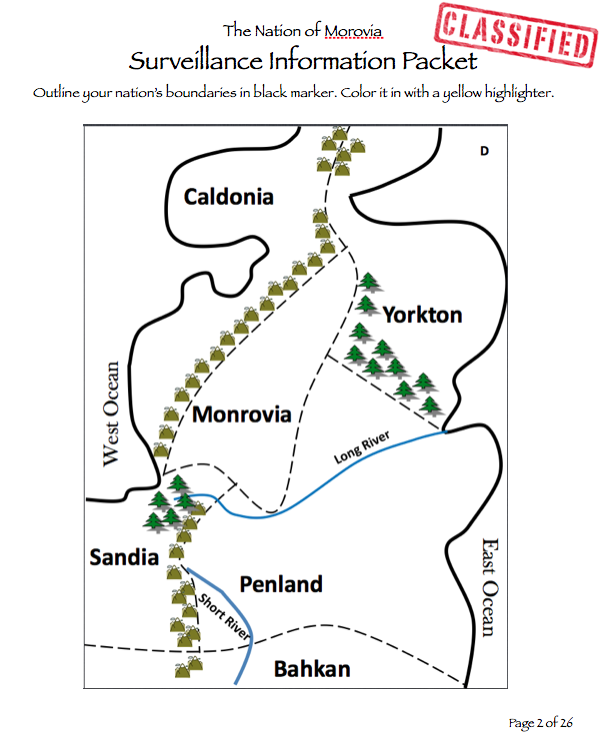 The six major nations are: Bahkan, Caldonia, Morovia, Penland, Sandia, and Yorkton. Each nation needs to get familiar with their geography. To do this, each group will complete pages 2 - 3 of the Surveillance Information Folder. Find your country on the map. One group member needs to outline your nation's borders with a black marker. Another group member needs to color in your nation with a yellow highlighter. 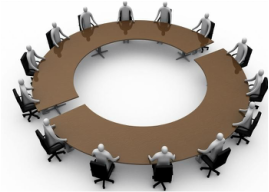 The whole group group needs to discuss and answer the questions on Page 3. You may choose any group member to write the answers in the graphic organizer on page 3. You will have 10 minutes to complete Step 6. Now that you are a nation, you need to create pride in your nation. To do this, your group will create a national flag. Follow the directions to create a flag. On the Vice President's computer click on the icon to the right called Scholastic Flag Maker. 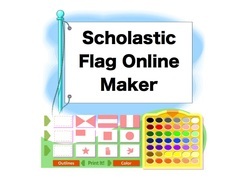 Follow the online directions to create a flag as a group! When you are done, select print and save as a pdf. Save the PDF to your desktop as your nation's name and your homeroom. (Ex. Penland-Wendt). Air drop me your flag. I'll print it out for your Surveillance Information Packets. Glue this to the bottom of Page 1 in your Surveillance Information Packet. If I have enough ink, I will print out a second copy and hang them in the hallway as well. I've embedded an example below. I also embedded page 1 to show you where the flag should be glued. You will have 10 minutes to complete Step 7. At this point, you have held elections, identified your location and geography on the map, and created a national flag. You are a proud nation! It is now time to understand the world you live in and your nation's place in that world. I will read the movie credits below to the class. Please turn off the volume on your computer if you have not already. For those of you who are not impressed by my Star Wars Intro, I have embedded the LARP World Situation in a document below these credits. 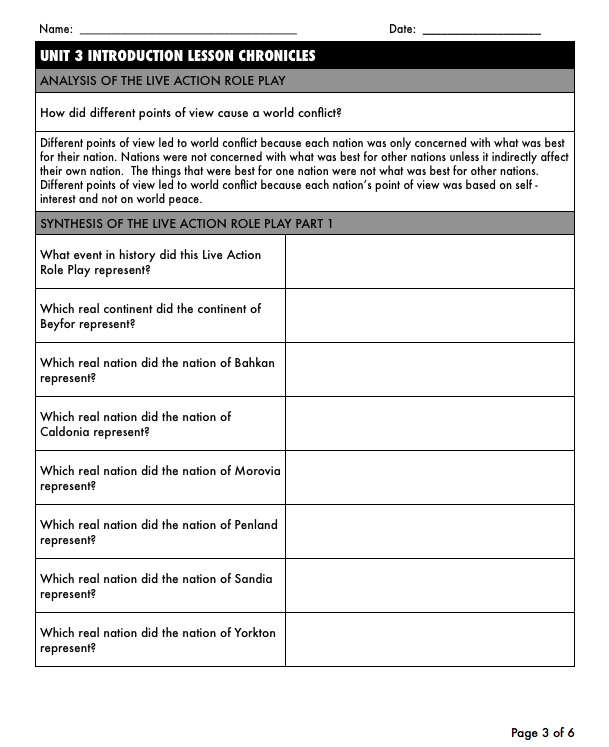 You may also read along on Page 4 in your black folder - The World War Live Action Role Play Information Folder. After the reading, you need to turn to Page 4 in your colored - Surveillance Information Folders. Skim back over the LARP World Situation above to complete the first two boxes under Information on Page 4. Any group member may write the answers in the boxes. The planet of Arymitha is not as advanced as we are today. They do not have the internet or computers. They have to rely on telephones and telegraphs to communicate. There are no televisions. People must get their news from Newspapers. The Newspaper Business is a tough gig. Newspapers in every city on the continent of Beyfor must compete to sell their newspapers. Newspaper companies always look forward to the State of the Union Addresses from each nation. This is when each nation holds a press conference to inform their nation about how the nation is doing. The paper has just publish the World Statistics outlining important information about each nation. The World Stats are embedded below. You can also find these on Page 5 in your black - World War Live Action Role Play Information Folders. You will have 10 minutes to complete Step 8. As a nation, look over the World Statistics. 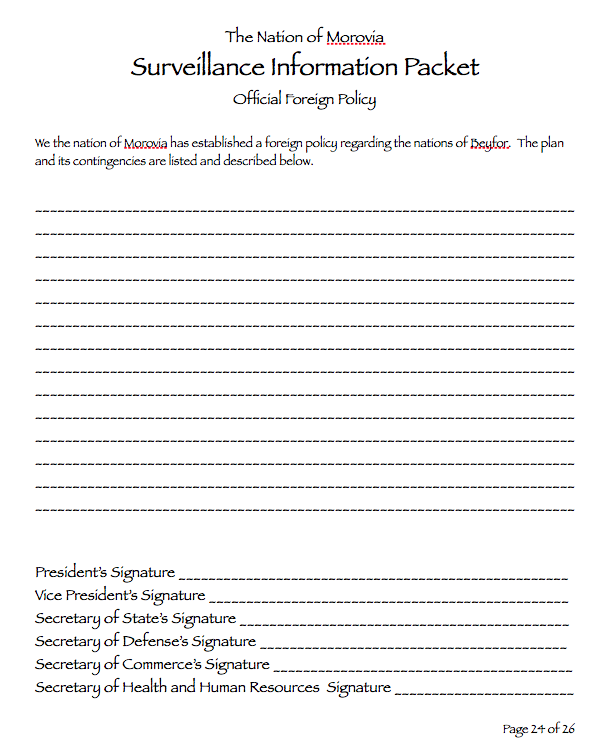 Fill in the boxes on Pages 4 and 5 in your colored Surveillance Information Packet under Alliances, Army Strength, Navy Strength, Population and Income. In their competition to sell newspapers, newspaper companies began using a tactic called yellow journalism. Yellow Journalism is when newspapers exaggerated the truth or embellished stories to make them seem a bigger deal than they actually were. As leaders of your nation, you have to be careful with national information. Some information has to be kept confidential or classified. Classified information is information about a nation that must be kept top secret to keep the nation safe. Each nation is about to hold national meetings about their classified intel. You must keep this information secret. You do not want other nations to know and you definately do not want newspapers to get the information and exaggerate it. If this information gets out, it will threatened peace in your nation. So follow the directions below carefully. You will have 15 minutes to complete Step 9. When I tell you too, find a place in the room to meet. You may sit on the floor or stay at your tables. You may not go outside the room or in Mrs. Smith's Temper Tantrum Room. Turn to Page 6 in your black - World War Live Action Role Play Information Folders to the Confidential Data page. As a group read pages 6 and 7. You may have one person quietly read it to the group or you may have each person read it to themselves silently. After you read it, discuss what you read very well. Remember to keep your discussion quiet. You do not want other nations or the press to hear what you are discussing. When discussing, make sure you know who can hurt you and who can help you. Look over your location, resources, military, alliances, and any information about your economy to determine your advantages and disadvantages. Make sure you know who has alliances and make inferences about other nation's relationships based on all the information you have gathered so far. After discussing it, complete Page 5 in your colored Surveillance Information Packet under Confidential Information. Remember, a foreign policy is a nation's plan for dealing with other nations. 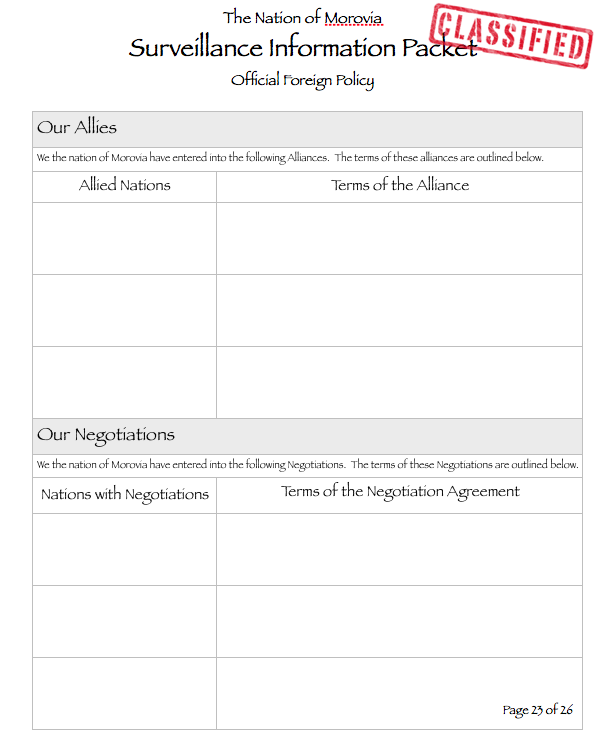 In the Foreign Policy box on page 5, summarize the major points in your Foreign policy that you read about on Page 7 in your black - World War Live Action Role Play Information Folders. I did not embed the classified information. This information is only in your black - World War Live Action Role Play Information Folders. Page 5 in your colored Surveillance Information Packet is embedded below. The government of Bahkan has reported that Penland nationalists have staged a massive armed attack along her boarders. They have taken control of the East River and have bombed government facilities in the capitol. It is believed that the raiders are members of the same group which have been staging smaller raids on the Bahkan border in previous months. This action is by far the most serious yet taken by Penland sympathizers. Bahkan officials charge that this attack was led by the regular Penlandian Army, and is an act of outright aggression against Bahkan territorial integrity. Governmental representatives Penland have refused to comment on the current crisis. This leads to speculation that Bahkan officials are making a legitimate charge. There are also reports that there have been massive troops movements in Penland, both in the direction of Sandia and Yorkton. ​You will have 15 minutes to complete Step 10. As a nation look over the news bulletin above. You can also find it in your black folder - The World War Live Action Role Play Information Folder on Page 8. Discuss the current world crisis and try to come up with a peaceful solution to the crisis. On Page 6 of the Surveillance Information Packet, write an official peace proposal. You do not want to suggest anything that might hurt your nation. Look at alliances and friendships between nations. Try to find a compromise that all involved can be happy with. The six major powers of Beyfor have decided to meet and discuss the current crisis. Each nation has been asked to bring their peace proposals to the summit. The president of each nation will present these on behalf of their nation at the summit. Your goal is to analyze each nation's proposal and come up with something that everyone involved can be happy with. You also have another goal. As you listen to each nation's proposal, listen closely for things that might mention or insinuations they make that will give you more information about what each nation's pursuits and interests might be or any secret alliances and negotiations they might have that could affect you. Follow the following directions to complete the Summit. ​We will have 45 minutes to complete Step 11. Each Group will have 5 minutes to present their proposal and we will have 3 - 4 minutes of group discussion about their proposal. Open your colored - Surveillance Information Packet - Page 7 - 12. 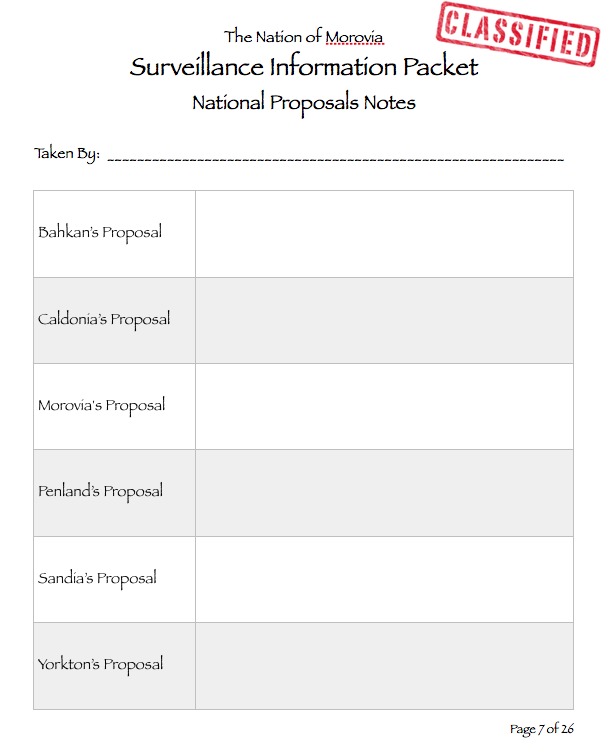 Each group member needs to take one of the National Proposal Notes Pages from this section. As each nation's president presents their nation's proposal, take notes on what they propose. Make notes of extra information you pick up about each nation's pursuits and interests, secret alliances and negotiations they might have that could affect you. Everyone in the group must take notes! I have embedded the National Proposal Notes below. Remember pages 7 - 12 are all the same thing. Each group member takes one to complete it and then you will but it back into the folder. ​You will have 45 minutes to complete Step 12. Now that each nation's president has read their nation's proposal, nations need to meet again to review the various suggestions. Your nation needs to look over your notes. What have you learned about other nations while listening to their proposals? How can you use this information to help your nation? Who your friends are and who your enemies are. How can you make your position better? Who might be willing to work with you and why? Who could you form alliances with? How would it help you? Who could you make a compromise or a negotiation with? Why? How could it help you? In this activity, you have a group of 10 graphic organizers. There is a set of 2 graphic organizers for each nation other than your own. 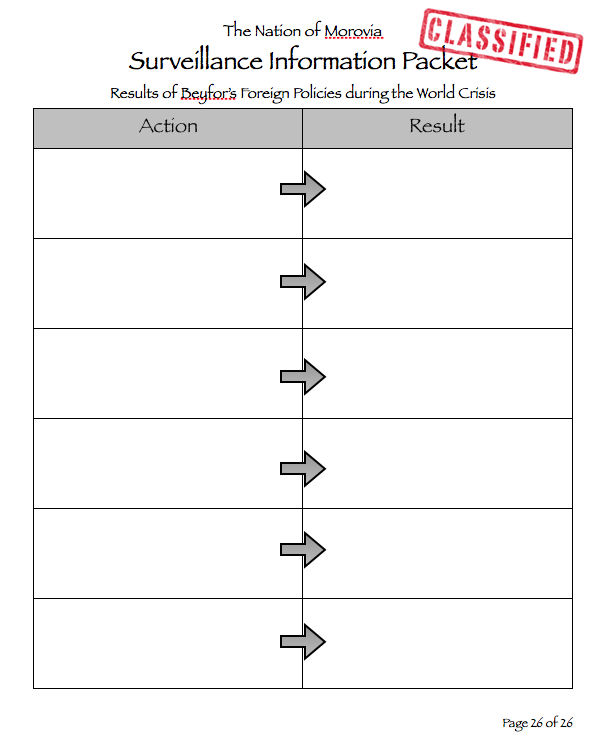 These graphic organizers are to help you organize all the information you have gathered so far and create a foreign policy plan for your nation. 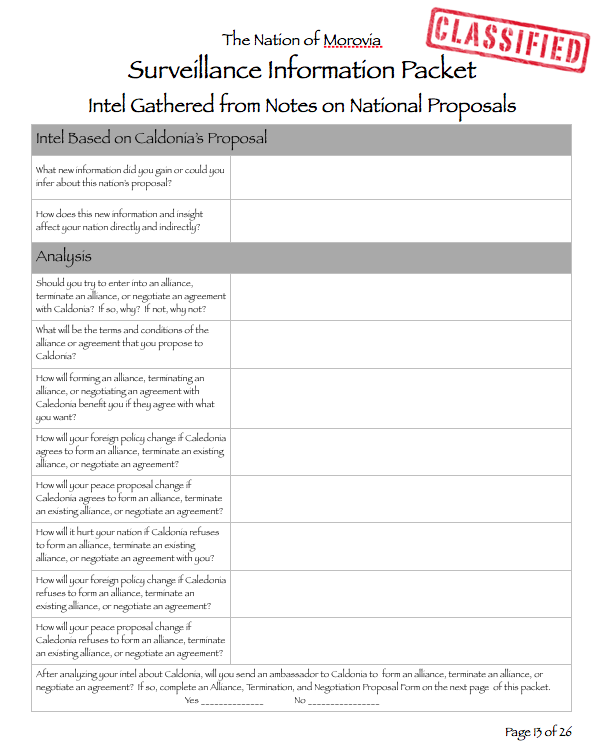 The first graphic organizer in the set is the Intel Gathered from Notes on National Proposals Organizer. 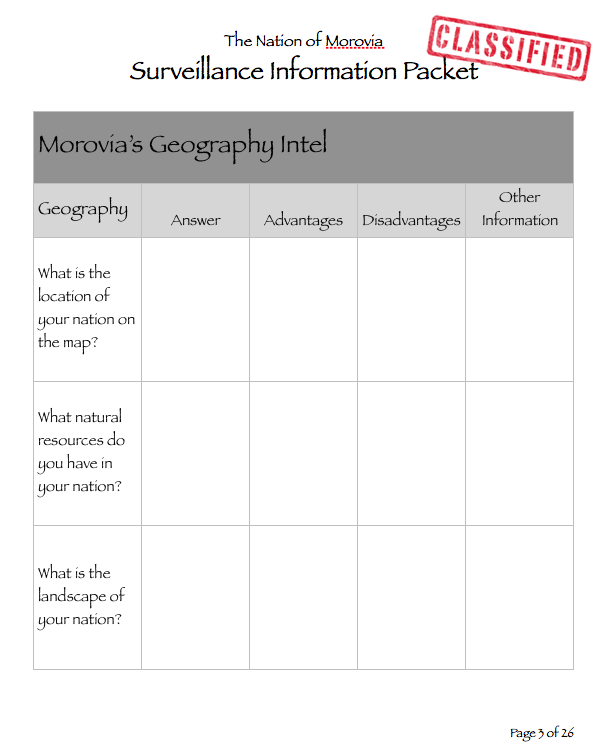 This graphic organizer asks you guided questions to help you collect and organize all the information you have collected on each nation individually. When you complete the first graphic organizer, you will move on the the second graphic organizer for that nation. The second graphic organizer is the Alliance Formation, Alliance Termination, or Negotiation Proposal for the nation in which you just gathered intel. With this graphic organizer, you need to determine if you want to form an alliance, terminate an alliance, make a negotiation, or break a current negotiation deal. If you do not want to form an alliance, terminate an alliance, make a negotiation, or break a current negotiation deal, simply write "No Action" by Proposal Type and move to the next set of organizers on the next nation. If you do want to form an alliance, terminate an alliance, make a negotiation, or break a current negotiation deal, fill out the form. When you finish the 5 sets of graphic organizers, you may go on to Step 13 Diplomatic Missions. I will go over Step 13 now so that you can go on after completely step 12. 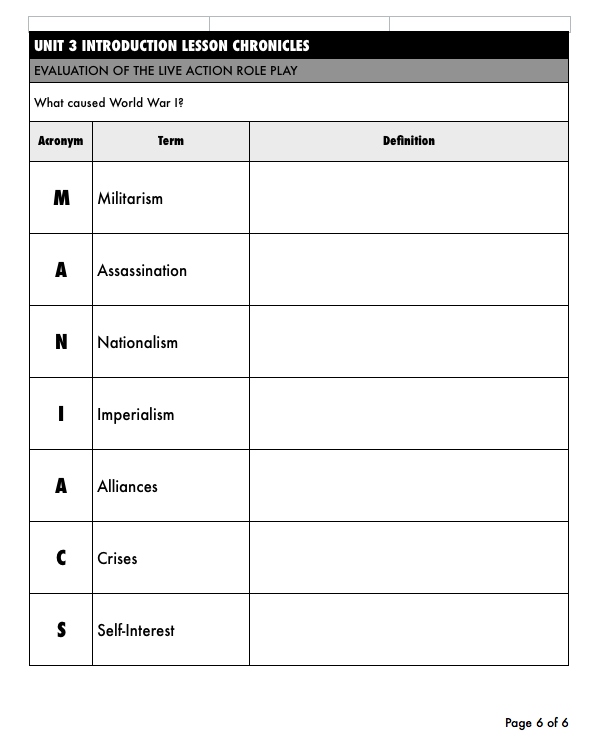 I have embedded one nation's graphic organizer set below so that you can check to make sure you are on the correct pages. A diplomatic mission is when one nation sends one representative or a small group of representatives to another nation to talk about issues, work out negotiations, or make alliances. Your nation has finished planning your goals for your foreign policy and are ready to depart on diplomatic missions to other nations. Follow the directions below to complete your diplomatic missions. ​You will have 45 minutes to complete Step 13. When your group completes Step 12, raise your hand. I will act as your communication device. Tell me where you want to go on your diplomatic mission. If the group you want to go to first is meeting with another group, I will ask for the next nation on your list of diplomatic missions. When you arrive, you will introduce yourselves and tell them what nation you represent. Then you will go over the terms of your proposal. 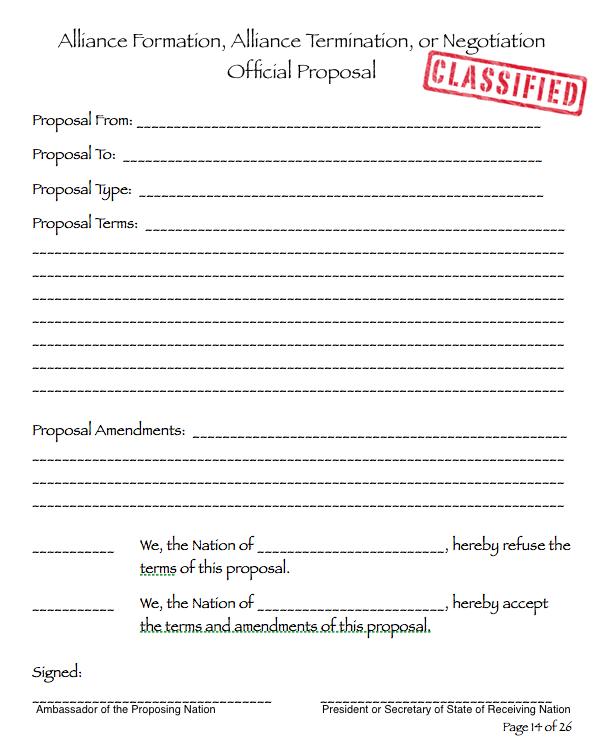 The receiving nation can accept the proposal as is, amend the proposal, or reject the proposal. If the receiving nation accepts the proposal as is, then they will fill out the bottom portion by checking the accept line and putting in the name of their nation. Then all parties will sign and the diplomatic mission is over. If the receiving nation wants to accept the proposal but wishes to change the terms in some way, both nations will discuss the new terms, and write them on the amendments line. The receiving nation will check accept and both nations will sign it. If the receiving nation rejects it, they will check reject and both nations will sign the terms. When you have completed all of your diplomatic missions, you will come back to your nation and go on to Step 14. ​You will have 20 minutes to complete Step 14. After you have finished all of your diplomatic missions, you are ready to compile the information and construct your foreign policy. On Page 23 of the Surveillance Information Packet, you will list all of the new negotiations and alliances with any that you previously had. List each nation and the terms of each negotiation and alliance. Our foreign policy is to maintain peace at all cost. We wish to be peaceful because _____________________________. Our plan for remaining peaceful is ___________________________. We feel the advantages in remaining peaceful are ____________________. In the event we are attacked, we have established a contingency plan. We fear the nation of ___________________________ might attack because ________________________. If this nation should attack, we plan to _______________________________. I have embedded pages 23 and 24 below the chart. When you have completed these two pages, go on to Step 15. ​You will have 10 minutes to complete Step 15. After you have finished you foreign policy, it is time to re-evaluate your official state peace proposal. Look at your 1st peace proposal for the world crisis. Then turn to Page 25 of the Surveillance Information Packet, this is your official peace proposal for the Beyfor Crisis. Did the things your learned, new negotiations, or new alliances change your ideas about your 1st peace proposal? If not, write your nation by prepared by, and on the lines write - "NO CHANGES". 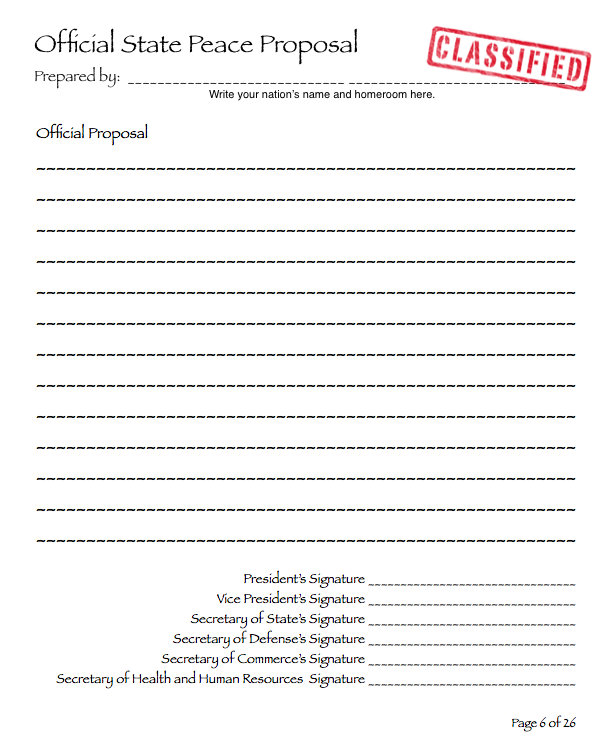 Every member needs to sign the proposal. If it did, write your new peace proposal. Then sign it. The neutral nation of Dantok of the continent of Beyfor has invited the six major nations of Beyfor to a peace summit to reevaluate peace proposals to the continental crisis. Publicly, the situation remains unchanged. It is our sincere hope that all nations in Beyfor have truly considered proposals to bring an everlasting peace to Beyfor. Currently, Penland nationalists continue to wage massive armed attacks on Bahkan's borders and have full control of the East River. The capitol is destroyed and Bahkan's government officials have relocated to a secret location. Penland officials have denied any involvement in the attacks but they have made no arrests and raids on Bahkan continue. Sandia and Yorkton officials have both reported Penland troops mobilizing at their borders. ​We will have 20 minutes to complete Step 16. We will now participate in the Beyfor Crisis Peace Summit. Each nation will stand and read their national peace proposals. You will have one last effort to revise any alliances, negotiations, or other parts of your foreign policy. Once all nations have finalized it, we will go on to world events. ​We will have 45 minutes to complete World Events. We will now participate in world events by having each group stand up and read their foreign policy. After a nation reads a component of their foreign policy, I will ask each nation what their reaction will be according to their own foreign policy. We will track each result using Page 26​​ of the Surveillance Information Packet. When every group has presented, we will examine the the final result of the crisis as a class. Page 26 is embedded below. We will have 45 minutes to complete Lesson Chronicles. Now that we have completed the Live Action Role Play, it is time to connect what you experienced to the real event - World War I. 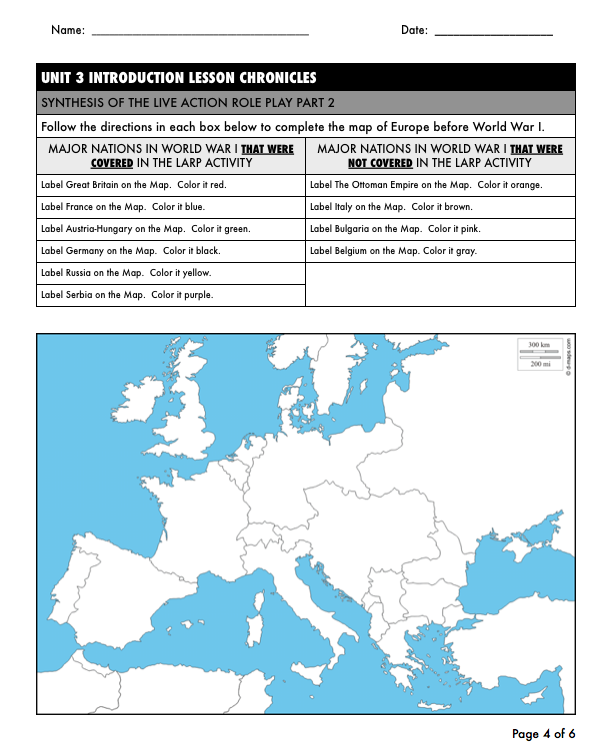 As we make these connections, we will chronicle what we learn in our World War I Lesson Chronicles. You will have 20 minutes to complete this activity. You will have 10 minutes to complete this activity. Below is a list of the vocabulary words from this lesson in alphabetical order. First, find the word that matches each definition on page 2 of your Lesson Chronicles. Then determine which words below were not in the graphic organizer on page 2. Write these words and their definitions at the bottom of the chart on page 2. You will have 5 minutes to complete this activity. Click on the icon to the left to see which real nations the Live Action Role Play nations represented. You will get a password from me to type in after clicking on the icon. Use the page to complete page 3 in your Lesson Chronicles. Click on the icon to the left to view a map of the real countries and alliances that were represented in the Live Action Role Play. You will get a password from me to type in after clicking on the icon. 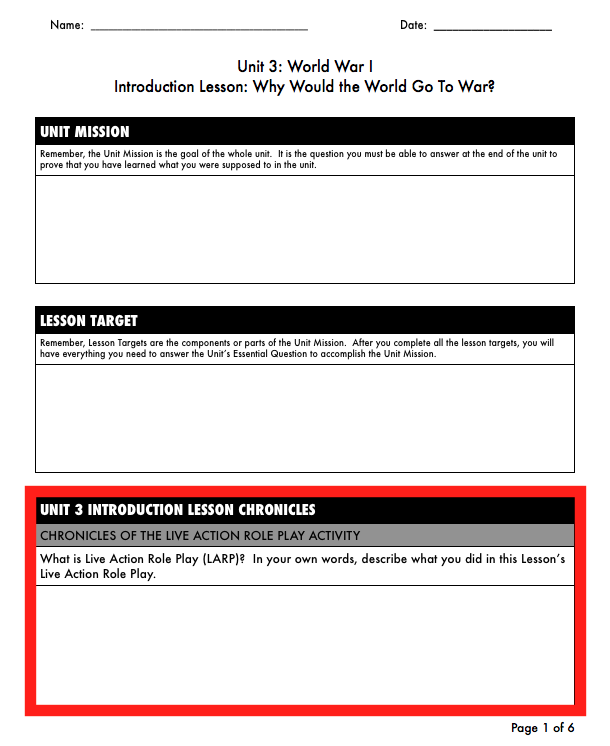 Use the page to complete page 4 in your Lesson Chronicles. You will have 15 minutes to complete this activity. 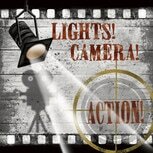 Click on the icon to the left to view the chain of events in World War I that were represented in the Live Action Role Play. You will get a password from me to type in after clicking on the icon. 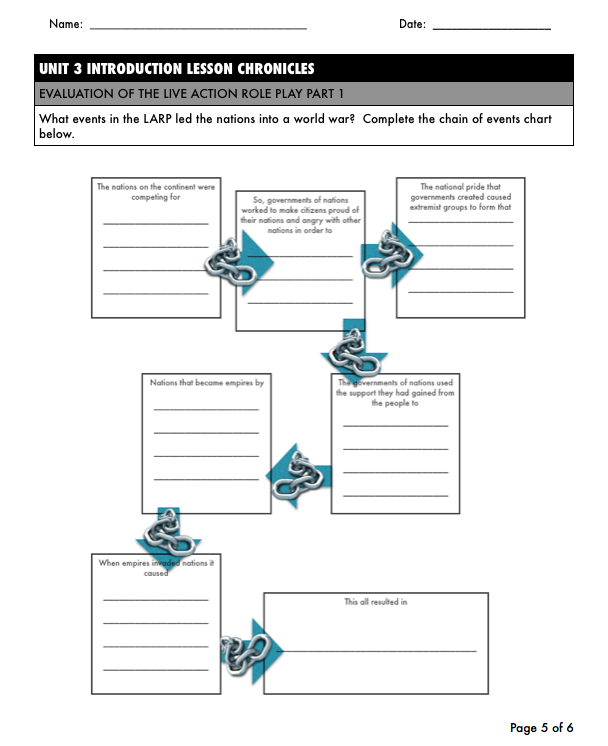 Use the page to complete page 5 in your Lesson Chronicles. Click on the icon to the left to view the the part that MANIACS played in causing World War I. You will get a password from me to type in after clicking on the icon. 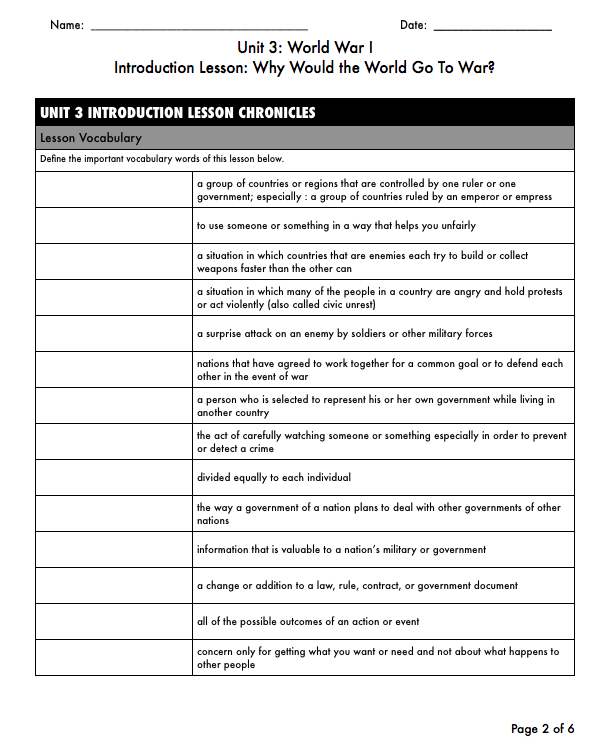 Use the page to complete page 6 in your Lesson Chronicles. Every time you learn something new, it becomes a part of who you are for several reasons. First of all, you use things that you learn as a foundation to learn other things. You also apply what you learn to new experiences. The things you learn influence decisions that you make and your decisions help mold you into who you are and who you will become. Many people often ask, "What's the point in studying history?" "Who cares what people in the past did?" I could spend hours explaining the many reasons history is important but let's start with only one reason today. It can best be explained using a story. In 1905, a famous philosopher named George Santayana said, "Those who cannot remember the past are condemned to repeat it." 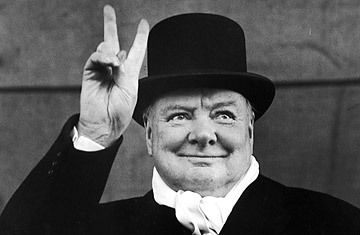 Forty-three years later after World War II, Winston Churchill, the former Prime Minister of Great Britain gave a speech. He used the quote but changed it slightly saying, "Those who fail to learn from history are condemned to repeat it." First of all, Churchill changed the quote because what he learned became part of who he was. He had seen the devastation of two world wars! He applied the quote to his experience. What he learned became part of who he was. He changed the quote to show that it is important not only to remember our history, but to learn from it, because if we do not, we will repeat those mistakes. The world did not learn what it needed to learn from World War I so the world repeated their mistakes causing us to enter into World War II. Many times people today criticize the choices of people in the past. They look at the situation or event and say, "it was so obvious that these people were making a stupid decision. Why did they act the way they did? What was wrong with them?" No, these people were not stupid or crazy. When choices lead to an event or situation, they produce consequences. The next generation are the ones who pay the price or reap the benefits of those consequences. They learned a lesson from the choices that were made. They teach the next generation how to avoid the the poor decisions made that produced negative consequences. This generation starts off with the knowledge learned from these consequences, so when they look back and learn about the poor choices made by people in history, it seems obvious that these people made the wrong choice. World War I could have been avoided. We know that today. I could give you a lecture on this. You'd say, "Wow, those people were really dumb!" and we could move on to the next lesson. After all, we obviously understand that the decisions made that started World War I produced horrible consequences. But is that enough? To truly learn from history, we must understand how human wants, needs, and emotion drive our decision making. We need to understand the importance of constant, positive communication with others. Unless we develop of ability to put ourselves in the place of others and experience what they experience, we can never truly learn from history. And though we know that certain choices will produce certain circumstances, we will continue to make those poor choices because we did not learn how human emotion played a part in our decision making. We did not learn how to use empathy to drive our decision making. You just finished participating in the World War Live Action Role Play. You know that the nations and events represented the nations and events of World War I. Some classes ended up in a world war and other classes did not. The point of Live Action Role Play is not to learn about World War I. The point is to learn how the emotions people felt drove them to behave the way they did and make the decisions they made. The point is to evaluate how identifying and relating to these emotions can help us to communicate and interact with others better in the future. This would not only help us to avoid repeating the mistakes of the past but help us to possibly avoid making poor decisions about problems and issues that we have not even experienced yet, in the future. How well do you know the vocabulary in this lesson? 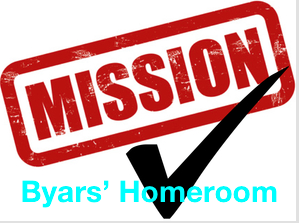 Click on the Mission Check icon below with your homeroom to check yourself. 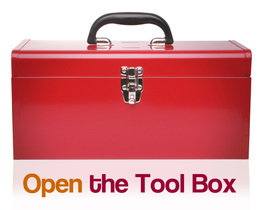 Remember, you may no longer use your Chronicles or the toolbox to help you. You should study your vocabulary words daily! You may go to the Lesson Vocabulary Games under the Toolbox to practice the vocabulary words in this lesson. This is a 50 point grade. If you finished all six pages of your lesson chronicles, you have accomplished your target for this lesson! Congratulations!